I thought finding a charity in London would be relatively easy. There isn’t issues with language barriers and dodgy translations to get around and it’s easy to check the legitimacy of a charity via The Charity Commission. An initial Google search brought up some of the well known charities such as Great Ormond Street, but the reason these types of charities are top of the Google listings is because they have enormous turnovers and advertising budgets. I delved a bit further and discovered a charity that I hadn’t heard of before which looked like they did some excellent work. No sooner had I proposed it the Sunshine Appeal Steering Group, I turned on Sky Sports News and here they were plastered on Tottenham Hotspur’s training kit. On further investigation they also had a sizeable turnover. I tried to narrow down my search to a charity in the vicinity of Wembley. That’s where I first found the name Lifeline 4 Kids. Their website had case studies of children they’d bought equipment for and they seemed to fit the bill perfectly. There was no e-mail address for them on their website so I submitted a message on their webform, introducing the Sunshine Appeal. A couple of weeks passed and I hadn’t had a response, so I decided to phone them. That’s when I first spoke to Roger Adelman the chairman of Lifeline 4 Kids. Roger had seen my message, but dismissed it as “too good to be true”. The charity get around 100 requests for help from families who need specialist equipment for disabled children so my one message offering money looked suspicious! I pointed him in the direction of this website so he could read about us, and once the penny dropped that we were genuine he was stunned that we found his charity and that we persevered to get in touch with them. The charity was established in 1961 and is completely volunteer run. They have minimal overheads and no budget to promote themselves, so they tend to work on word of mouth. They buy specialist equipment for children with disabilities from wheelchairs, to specially adapted shoes. Our donation of £5,000 will make a real difference to the charity. 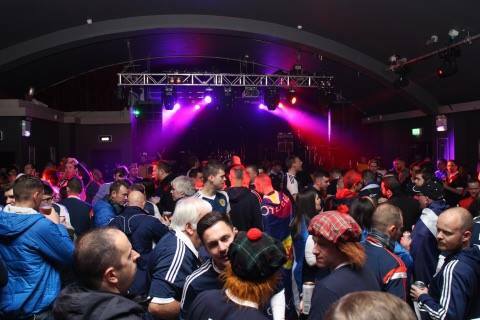 We arranged to do the 62nd consecutive away game donation at The Garage in Islington. 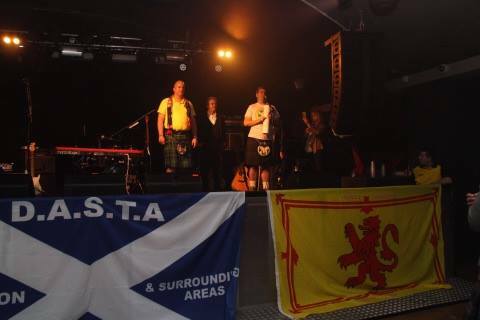 Tartan Army DJ Tam Coyle has been a big supporter of the Sunshine Appeal over the years, and he offered us the use of the stage at The Garage before The Tartan Specials gig. It was great to be able to do the presentation in front of 600+ of the Scotland fans whose generosity allows us to make these donations. 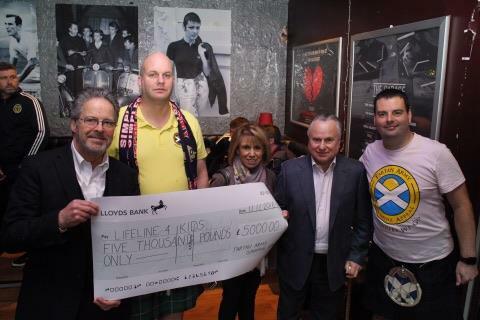 Roger and two others from Lifeline 4 Kids joined myself and Neil McDonald on the stage to receive the £5,000 cheque. 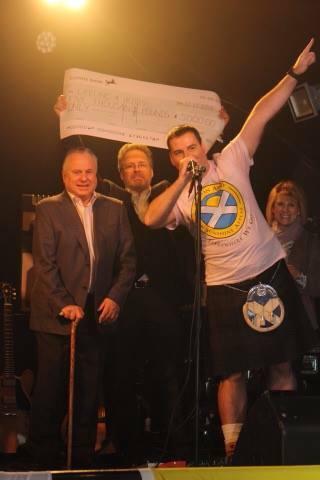 Roger has since re-iterated his thanks at the generosity shown by the Tartan Army, and for the great work we do.